Below you will find the official ILOA uniform guidelines and requirements. If you have any questions regarding uniform minimum requirements (particularly for starting officials) please contact us at info@idlaxref.org. You do NOT need to use these sources – they are made available for reference. We have some “special starter packages” set up with East Side Lacrosse for the ILOA. They can be found at the link below. You do NOT need to purchase these, but they seem to present solid value. NOTE: You do NOT need to purchase pants, although they are included in some starter packages. It is OK to wear any black (or very dark) athletic pant over your shorts for very cold weather. Hat: Black with white piping lacrosse officials hat. 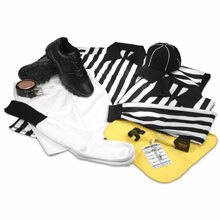 Shirt (short/long sleeve): Lacrosse officials striped short/long sleeve shirt. In case of poor weather, striped jackets may also be worn. NOTE: New refs may want to purchase a short sleeve shirt, and wear a long sleeve black undershirt for cold weather. Belt: Black belt. May be leather or webbed. Shorts: Plain black shorts. Highly recommend looking in the golf section of local sports shops. No cargo pockets. Socks: Black “ankle” socks. The quarter length sock should cover the ankle bone. “No-show” and “crew socks” are prohibited. Shoes: Ideally full black cleats or turf shoes. If you do not own a pair of full black shoes yet, don’t sweat it, but please keep it in mind when buying your next pair. Whistle: Highly recommended – Fox 40 finger grip whistle. NOTE: Scorecards for 2018 going forward will likely be shaped for new Federation lacrosse head dimensions (similar to current card shaped scorecards), so please consider getting new scorecards for Spring 2018 forward. Pencil: Pencil for keeping track of score on scorecard. Highly recommend – “bullet pencils” or short mechanical pencil. Penalty Flags: Black ball penalty flags are recommended. Two yellow penalty flags. Tape Measure: Sturdy retractable tape measure for equipment checks – at least 72 inches. Recommend black. Lacrosse Timer (required for JV and Varsity): Lacrosse 20-second timer, dual timer highly recommended. Simple less expensive timer. New RefSmart Timer. Ready Ref timer – more expensive, but well recommended. Coin (for pre-game toss): Official lacrosse coin or other coin such as a 50-cent piece. US Lacrosse Certification Patch: Worn on left sleeve centered with the top of the patch roughly 3″ below the shoulder seam. ILOA Patch: Worn on right sleeve centered with the top of the patch roughly 2.75″ below the shoulder seam. If added to a shirt with a sublimated USL Certification patch, match the center of the patch to the center of the USL patch.